Starters with the Haddonfield girls' lacrosse team pose with head coach Jessica Blake (rear, left) at practice. Players, rear, from left: McKenzie Blake, Gabi Connor and Ashley Campo. Front, from left: Elise Fiannaca and Wayden Ay. There was a game last lacrosse season — just one game — when Haddonfield’s Jess Blake put on her figurative “mom hat” while coaching her daughter, McKenzie. It was the Group 2 state semifinals against Rumson-Fair Haven, and McKenzie’s typical poise was shaken in a way that only a mother would pick up on. Treating her daughter like just another player on the field was a product both of design and circumstance for Blake and her Haddonfield girls’ lacrosse team last season. McKenzie wasn’t going to stand out just because she was the coach’s daughter — even without the concerted effort by her mother to make sure of it. The Bulldawgs were too talented, the team had too much chemistry. The expectations were too high. McKenzie would have to earn her spot. That's exactly what she was expected to do. And that’s exactly what she did. Starters with the Haddonfield Memorial High School girls lacrosse team poses with head coach Jessica Blake (rear, left) at practice March 26, 2019. Players, rear, from left: McKenzie Blake, Gabi Connor and Ashley Campo. Front, from left: Elise Fiannaca and Wayden Ay. The team could be the best in the state this season. As a freshman playing attack, she led Haddonfield in scoring (85 goals, 25 assists), including four goals in the Group 2 state championship — a win that marked the first state title for Haddonfield girls’ lacrosse. With the new season beginning Wednesday, Haddonfield returns virtually its entire roster from that state title run. The Bulldawgs feature arguably the state’s most talented and deepest senior class. And they feature McKenzie Blake, a sophomore who, like her team in general, has seemingly limitless potential. The Blakes, in recent years, have taken Haddonfield High School by storm. Call it a golden age for the family. Aiden Blake, Jess’ son and McKenzie’s brother, is a star for both the Haddonfield boys’ lacrosse team and a basketball team that won the Group 2 state championship earlier this month. Jess Blake has coached the girls’ lacrosse team since its inception in 2009. She quickly — remarkably quickly — helped turn the program into a powerhouse, culminating with last year’s 21-2 record and state title. Combine that with McKenzie’s meteoric rise, and, clearly, it’s a good time to be a Blake in Haddonfield. The family is reserved about its success. But when pressed, they’ll tell you it’s been something of a dream come true. And Jess Blake concedes it sometimes seems surreal. Both spent large portions of their childhoods on the Haddonfield lacrosse sidelines and, before that, on the sidelines of the St. Joseph’s University women’s lacrosse team, where Jess coached previously. McKenzie Blake, remembers idolizing and emulating former Bulldawgs players. She would practice with her brother for hours after school at their mother’s games and practices. And somewhere along the way, she fell in love with the sport. Just as she looked up to the players on the field back then, McKenzie said it was her goal to have younger girls at her high school games look up to her. It didn’t take her long to reach that goal. She’d played with many members of the current senior class on club teams and at camps for years before high school. She’d even gone through the growing pains of having her mother as her coach. She’d been coached by her mother in Haddonfield’s youth program since fourth grade. It’s helps explain her seamless transition. And it only adds to the excitement for this season. 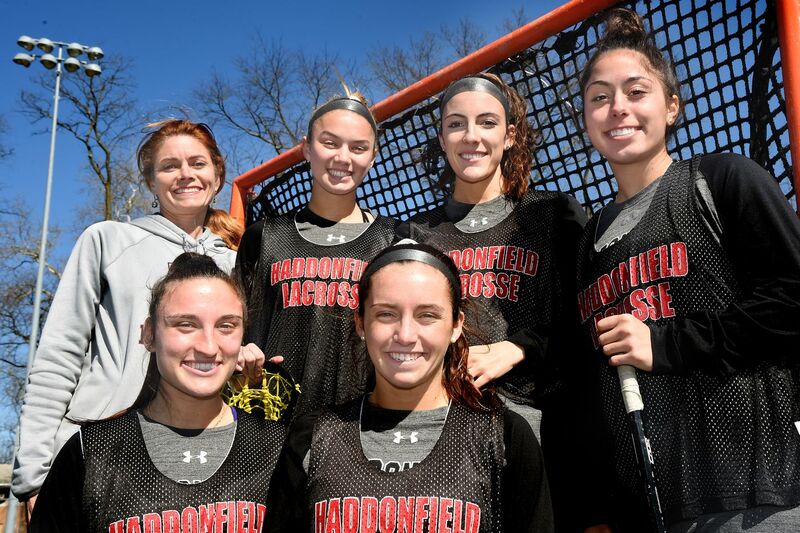 Haddonfield’s senior class consists of seven girls set to play college lacrosse — by far the most in school history. The list includes Natalie DePersia, a Rowan recruit; Brooke Fiannacca (Rochester); Elise Fiannacca (James Madison); Ashley Campo (Rutgers); Wayden Ay (Georgetown); Gabi Connor (Gettysburg); and Caroline Beckett (Catholic University). Last year was the best season the young program has had. And this year, a state title might be the least of what the team can accomplish.